Random Crud > Could Hillary choose Bill as her Vice President? The 12th Amendment to the Constitution: The 12th Amendment (proposed in 1803 and ratified in 1804) set up the modern system of electing the President and Vice President - because before then it was quite possible to get a President and Vice President from opposing political parties. As far as this discussion is concerned, the 12th Amendment also provides in part "no person constitutionally ineligible to the office of President shall be eligible to that of Vice-President of the United States." The 22nd Amendment to the Constitution: The 22nd Amendment (passed by the Congress in 1947 and ratified in 1951) set up a term limit on Presidents barring a person from becoming President for more than two terms. However the question that arises is what do these two laws mean in combination? The first issue is what specifically the 12th Amendment limits. Does it limit who can serve as Vice President, or does it limit who can be elected as Vice President? This is not purely an academic question of wording, because it's a possible a person who is not elected to Vice President could succeed to that office if the previous Vice President dies or resigns. The exact wording using in the 12th Amendment are: "But no person constitutionally ineligible to the office of President shall be eligible to that of Vice-President of the United States.". To me, the text of that sentence, standing alone, suggests it concerns who is eligible to serve as Vice President, not just who can be elected to be Vice President. However, if you read the sentence in its original context, it comes at the end of a paragraph about the electorial process, suggesting perhaps it does mean who can be elected to be Vice President. (I suppose that it's also possible that the issue of Vice Presidential succession wasn't seriously considered at the time that the 12th Amendment was passed, hence the ambiguous wording). The second issue is what the word "constitutionally" in the phrase "no person constitutionally ineligible to the office of President shall be eligible to that of Vice-President of the United States" is supposed to mean. Does it mean constitutionally as in the original US Constitution (which contained qualifications of age, citizenship, and residency)? Does it mean constitutionally as in the Constitution at the time of the 12th Amendment (which would impose the same restrictions as the original Constitution)? Or does it mean constitutionally as the Constitution stands now, including the 22nd Amendment with its term limits (which makes Bill Clinton ineligible to become President)? Now depending on how you interpret all this, it could mean that Bill Clinton is (1) eligible to be elected Vice President, (2) isn't eligible to be elected Vice President, or (3) isn't eligible to be elected Vice President but could succeed from another office into the Vice Presidency. It probably would need a Court case to sought out the definite answer - which is another reason why Hillary actually choosing Bill for her VP is exceedingly unlikely. As a final note, Bill Clinton himself has proposed altering the 22nd Amendment. His idea was that the term limit should only apply to two consecutive Presidential terms. 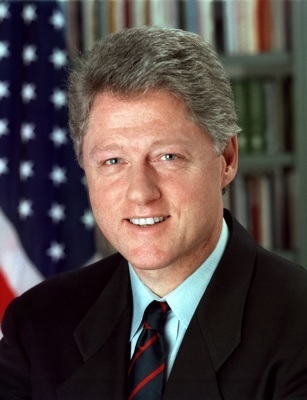 If Bill Clinton's proposal were adopted, then he would be eligible to stand for President or Vice President, including as Hillary's Vice President. There's probably not enough time to modify the 22nd Amendment before the next US Presidential election, but perhaps he could be Hillary's VP candidate for her second term election in 2012?